Random Noodling: Poetry Friday Round-Up Is Here! Poetry Friday Round-Up Is Here! Welcome to the Poetry Friday Round-Up. Leave your links and a brief description of what you're featuring on your blog this week. I'll summarize and post throughout the day. 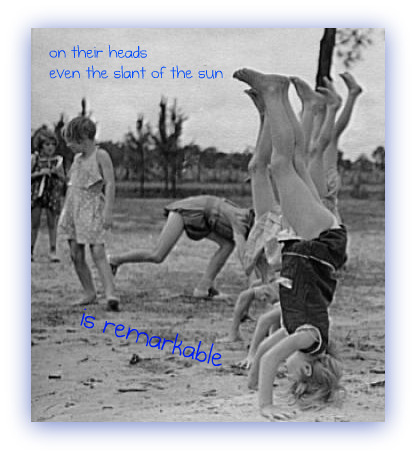 The haiga below is for all you poets--get out and stand on your heads! My alter-ego, Kurious Kitty, tells us about an exhibit on Emily Dickinson's garden and shares her poem, "May-Flower." And, at KKsKwotes there is a quote by Dickinson. Shelley has been writing about the dust bowl for nearly a year and has joined us this week. Check out her ongoing story in verse at Rain: A Dust Bowl Story. Amy at The Poem Farm is on poem #37 in her poem-a-day-for-a-year. She shares "No Choister," which is a poem about an oyster! Amy also brings us the results of Poem-in-Your-Pocket day at an elementary school and shares a joyous dancing poem by a third grader. At Check It Out we find kindergarten fibonacci poems--that's a mouthful, and that's a form I need to explore! Tiel Aisha Ansari has an original poem, "Lorca," at Knocking From Inside. The last verse will take your breath away! Author Amok is stopping in California on her 50 state poetry tour and sharing "Twin Cities" by Carol Muske-Dukes, the CA poet laureate. Gregory K. has a thesaurus poem for us. It's a companion to his dictionary poem, of course! A thesaurus is one tool I could NEVER be without! At The Drift Record Julie has another of Robert Williams Woods' poems about birds, this one is about a toucan. She shared one of his poems last week. I was so tickled by it, I went out and ordered a copy of How to Tell the Birds from the Flowers. Poor Mary Lee had an addled brain after grading papers, but luckily for us, it led to her writing a delightfully funny little poem! Check it out at A Year of Reading. Here in New Hampshire, we have a rather meager offering of poetry outings, but in D.C., there's a plethora of poetry activities as Sara shows us this week at Read Write Believe. I am sooooo jealous. And by the way, I agree with Sara's assessment of the FDR memorial. It brought tears to my eyes when I saw it, and read the quotes, a couple of years ago. At Wistful Wanderings (don't you love that blog name?) Alison has an original poem about procrastination. Procrastination is my middle name--just ask my editor! Right, Mur? Speaking of Muriel...at The Write Sisters, Mur shares "Lilacs" by Amy Lowell and a little "farmerly" advice! Jeannine writes about poetry about history, and explains her process in writing the recently released, Borrowed Names. Shelf Elf has included at poem for Mother's Day, which is this coming Sunday! (How many of you forgot? Tsk, tsk.) She also includes the trailer for a documentary about a father who realizes that his child is growing up. If the trailer had me reaching for the tissue box, what's the film going to do? Jama had my mouth watering when I looked at all the luscious photos of fondue makings. She shares a poem by Greg Pincus, "Ode to Chocolate Fondue," and a recipe to die for (or maybe that's to die from with its 1/2 pint of whipping cream). Ruth gives us a review of an anthology with middle-school appeal, Poetry Speaks Who I Am. Ruth also reminds us not to forget Haiti and she says, "The mourning continues even as rebuilding begins." Megan at Homeschooling on the Run went on a retreat with a Benedictine community and came back with "A Well-Ordered Joy," an original poem. My favorite lines: "Sometimes, I fall to watching faces at chapel./There are as many characters as hours in the Liturgy". Carmela from Teaching Authors checks in to say that this week, April Halprin Wayland will teach us about zeno poems. We're reminded that aside from it being Mother's Day, we also have National Picture Book Writing Week and Teacher Appreciation Week to celebrate! The Stenhouse Blog has a third-grader teacher sharing some pun-poems inspired by a new book by Ralph Fletcher, Pyrotechnics on the Page: Playful Craft That Sparks Writing. Toby posted a "word verification" poem. Don't know what that is? Check out The Writer's Armchair, then write one of your own to share! I love the title of Tricia's post today, "Talk Nerdy to Me." At The Miss Rumphius Effect Tricia shares a poem by Matthew Dickman. She also reminds us to check out the results of her weekly "Poetry Stretch." This week's stretch was to write a sijo. Little Willow at Bildungsroman posts part of the last stanza of "Tiger Lily," by Walter Adolphe Roberts, a poem of hope and strength. Becky reviews Mirror Mirror: A Book of Reversible Verse by Marilyn Singer. This is a book of poems that can be read from the top down and from the bottom up telling the same story from two points of view. Amazing! Karen Edmisten has graciously included Random Noodling in her original rhyming ditty, "Dreadlines." Send calming thoughts her way! The Cazzy Files has a poem for Mother's Day from Dear Mother, Dear Daughter: Poems for Young People by Jane Yolen and Heidi E. Y. Stemple. Best wishes to Cazzy as she earns her MLIS! Janet Squires looks at Mama Miti: Wangari Maathai and the Trees of Kenya, written by Donna Jo Napoli. Mama Miti means "mother of trees," and the book is about an environmental activist whose mission is the planting of trees in Kenya. Janet also includes companion titles. And, at Chicken Spaghetti, Susan brings us the season's footware of choice, flip-flops, in a poetic adaptation of a school "memo." Well poetry lovers, I've been rounding up poetry links for the past 12 hours. I'm going to call it a day. I will post any additional links tomorrow. Sweet dreams. One more...Father Goose (Charles Ghigna) posts a link to his article, "Light Verse: A Surprising Business." Good for Charles for continuing to write and sell something that makes people smile! I don't know if I'm putting this in the right place? But http://dustbowlpoetry.wordpress.com is a new place for poems about a family in hard times. You are most welcome there. Thank you for hosting, Diane! Over at The Poem Farm, I am writing and posting a children's poem each day for one year. Today is #37 - "No Choister." I am also featuring a children's poetry book and a Poem in Your Pocket school highlight. I have an original poem called Lorca. Thanks for hosting! Thanks for hosting, Diane! I offer 10 Tips for Writing Haiku with a haiku from Basho. Check out http://teachpoetryk12.com/10-tips-for-writing-haiku/. I hope you don't mind if I add my haiku to your haiga. Hi, Diane. I love the little found poem on that photograph! I'm posting a portrait poem about a "wild funny girl" by California Poet Laureate Carol Muske-Dukes. Hi, Diane - thanks so much for hosting Poetry Friday. Love those kids on their heads in the sand! I have another poem from How to Tell the Birds from the Flowers over at The Drift Record this week. Good Morning Diane and All! Today I think I'll stand on my head and check out the view! My poem for today resulted from a late night of grading social studies, math and reading papers. Love your haiga. I'd like to feature your work on Poetry Friday sometime. Email me if that's okay. I've got poets' graves today. Really! I'm trying to learn how to do a headstand in yoga. Now I'm really motivated! I'm in today with a guide to some of D.C.'s poetic and literary offerings, compiled for those attending next month's ALA conference and awards banquets, although much of the links are fun to play with even if you're miles from the nation's capital. Did you know you can download an audio poetry tour of D.C.? Thanks for hosting, Diane. I love the change in perspective in your haiga! I have an original poem on procrastination (no, I was not procrastinating when I wrote it). Hi, Diane! I like how you've gotten us all to spin around. I'm in with a fitting poem for Mother's Day this weekend: To a Child by Sophie Jewett. Today I'm sharing a poem about chocolate fondue by Greg Pincus: http://jamarattigan.livejournal.com/418911.html. Thank you for hosting! I have a book review today of a new anthology for middle schoolers. Here it is. Diane, thanks for hosting! Love that haiga celebrating the simple things. I'm in with a poem called "Brunch," from Robert Weinstock's new picture book, Can You Dig It? Thanks for hosting Poetry Friday, Diane! This week on the Stenhouse blog, read a couple of pun-poems from Ralph Fletcher's new book, Pyrotechnics on the Page. Thanks for hosting Poetry Friday! At Wild Rose Reader, I have a special poem for Mother's Day: Hope by Janet Wong from her book THE RAINBOW HAND: POEMS ABOUT MOTHERS AND CHILDREN. I hope everyone has a wonderful Mother's Day!!! I'm in today with a poem by Matthew Dickman. Oh, I have a correction! My name, at Across the Page, is not Muriel. It's Janet. My grandmother was a Muriel. My tagline comes from a Muriel. I am most definitely not a Muriel. Thanks for doing today's round-up! I posted Tiger Lily by Walter Adolphe Roberts at Bildungsroman. Thanks for hosting! I have an original piece I just dashed off -- on the theme of writing deadlines -- because I'm up to my ears in them and didn't have time to think intelligently about poetry this morning! :) It's called Dreadlines and it's here. Have a great Poetry Friday! Thanks for hosting! Today I have a poem in honor of Mother's Day. I offer a poetic picture book: Mama Miti: Wangari Maathai and the trees of Kenya, written by Donna Jo Napoli and illustrated by Kadir Nelson -- Simon & Shuster Books for Young Readers, 2010. This is a beautiful introduction to 2004 Nobel Peace prize winner, Wangari Maathai, known as Mama Miti (Mother of Trees), and the Green Belt Movement. I am in with a found poem about flip flops.